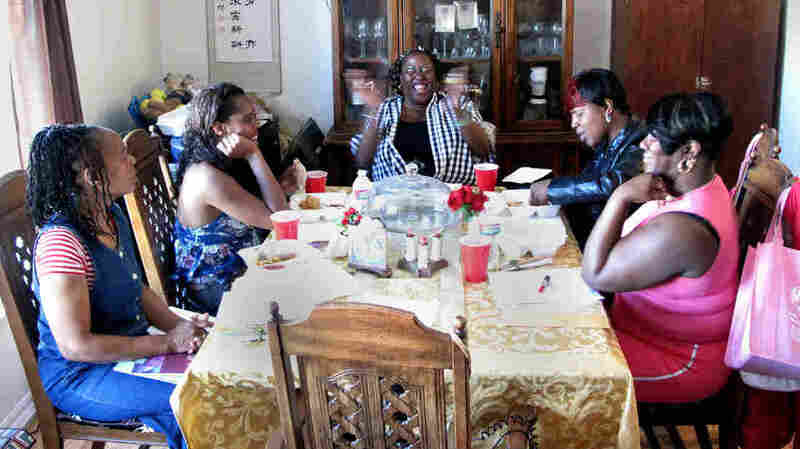 Struggling Families Lift Themselves Out Of Poverty An Oakland, Calif., nonprofit group encourages low-income families to figure out for themselves what they need to get ahead, and then helps them achieve their goals. Its pilot program for low-income families is proving to be a promising new approach to an old problem. It's been almost 50 years since President Lyndon Johnson declared a "War on Poverty." But today, the poverty rate in the U.S. is the highest it's been in 17 years, affecting some 46 million people. The economy is partly to blame, but even in good times, millions of Americans are poor. That's been a longtime concern for Maurice Lim Miller. He ran social service programs in the San Francisco Bay Area for 20 years. Then one day, the painful truth hit. "The very first kids I had trained back in the early '80s, I saw their kids now showing up in my programs," he says. He asked himself, "What am I actually accomplishing?" He knew he helped people, but he says, "I had wanted to see people get permanently out of poverty." Then, Miller got the kind of opportunity someone like him only dreams about. It came from Oakland's then-Mayor Jerry Brown, who was also frustrated with the lack of progress helping the poor. He called Miller at home one night to complain about plans for a new program. "And then he said, 'Look it, if you could do anything you wanted to do, and you really wanted to impact poverty, what would you do? And you come into my office next month and show me,' " Miller recalls. He says that for two weeks, he wracked his brain, but he realized he didn't know the answer. Then it dawned on him: His mother was a poor Mexican immigrant, and she had somehow figured out — on her own — how to get him out of poverty. So, he told Brown, why don't we take the money and pay poor families to show us what they would do? The result was the Family Independence Initiative, a nonprofit now run by Miller. Its purpose is to encourage low-income families to form small groups and help each other figure out how to get ahead. 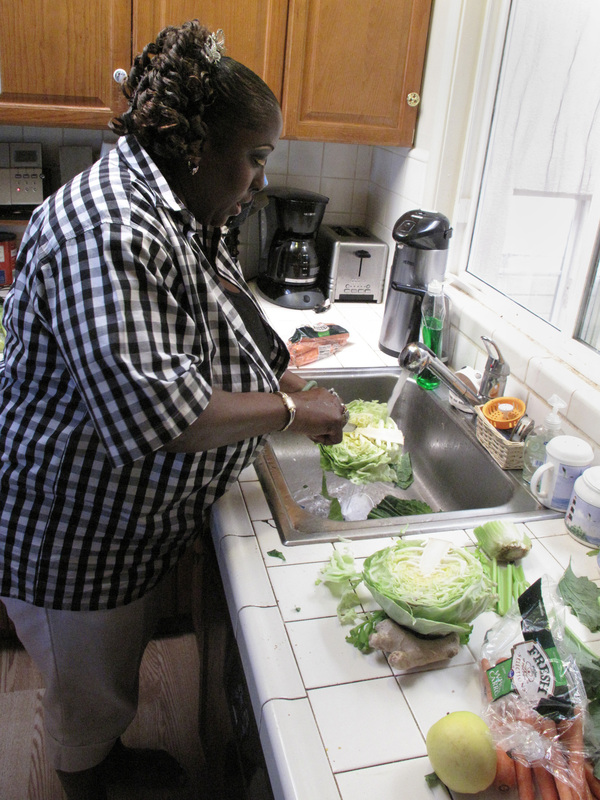 Yovanda Dixon washes vegetables in her San Francisco home to prepare a demonstration for her support group. The families meet monthly and keep journals, charting their progress on income, savings, education — all the signposts of a successful life. For this, each family gets a laptop computer and an average monthly stipend of $160. The key is that the families also get to set their own goals. One group, which met on a recent Saturday morning in San Francisco, calls itself the Fitness Five — five lively, sometimes boisterous, women. Hospital worker Shanna Chaney says their main focus is getting healthy. After all, it's hard to get ahead if you're ill.
"We all care about health — spiritual heath, everything," she says. "Especially me," chimes in fellow group member Yovanda Dixon, "because I'm a diabetic." Dixon knows, at 263 pounds, she has a few to lose. She's hosting the meeting at her house and has spread piles of produce on the kitchen counter — collard greens, golden apples, kiwi fruit, celery, beets and plenty more. She's prepared to show the others how to make a healthy drink in the food processor. But don't be fooled. The group is about a lot more than health. These women have seen a lot in their lives — cancer, depression, spousal abuse, drugs. Now, together, they're trying to turn things around. Two have started small businesses, and another is in graduate school. The others are raising young kids. They all worry about finances. Sitting around the dining room table, Chaney encourages the others to join a local lending circle. That's where everyone pools their money, putting a little aside each month. Then, they take turns borrowing it. It encourages savings, she says, and can improve your credit. The women also keep each other abreast of what's new in their lives. Dixon shares the latest about her business, which is selling scented oils and gifts. The other women congratulate her, which is one purpose of the group — to lend encouragement and support. 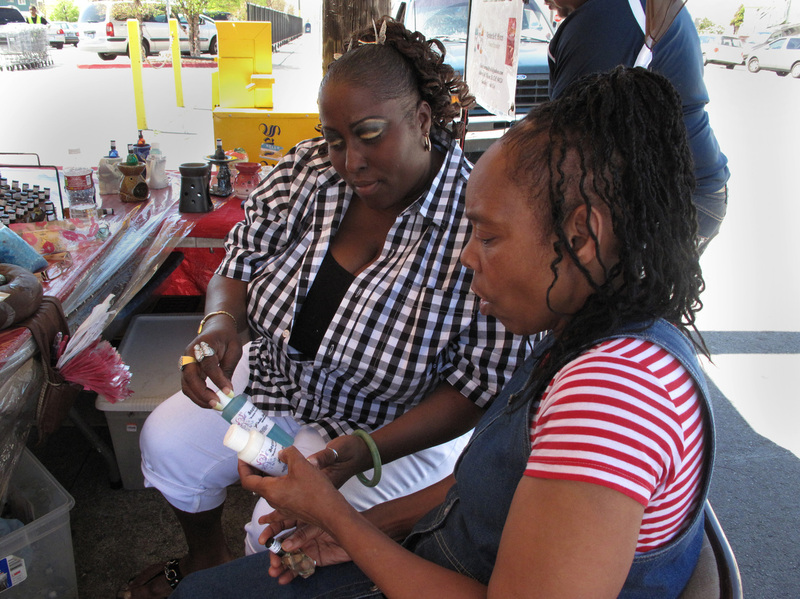 Yovanda Dixon (left) shows fellow group member Pamela Travis some of the bath oils she sells outside a San Francisco grocery store as part of her business Scentuality. It's all very unstructured. But Miller says that's the point. "The families have done well because we give them room to do whatever they feel they need to do to get ahead," he says. And the initial results have been impressive. The first 86 families that participated saw their incomes shoot up an average 20 percent over two years. Children's school grades have also gone up. So too have homeownership rates and savings. Miller says the key is that people feel in control, and they're encouraged to show initiative. That's unlike many traditional safety net programs, he says. "The problem with our system right now [is] it's all based on need. It's based on charity," he says. As soon as people start doing better, benefits are often cut off. The Family Independence Initiative also costs a lot less than other programs, which is one reason it's getting attention from both the left and the right, from the Obama White House to the conservative Heritage Foundation. But it's still largely a pilot program. About 300 families are involved right now in Oakland, San Francisco and Boston. The big question is whether the program can work for everyone. The families have done well because we give them room to do whatever they feel they need to do to get ahead. Maurice Lim Miller, founder and CEO of Family Independence Initiative, a nonprofit in Oakland, Calif. In her San Francisco apartment, Ramona Shewl, one of the Fitness Five, has her laptop open on the living room table. Pictures of her two sons are on a nearby bookshelf. Each month, she uses her laptop to send reports to the Family Independence Initiative with updates on her financial status, including her current credit score and how much she has in her savings and checking accounts. She says the Family Independence Initiative has given her discipline in a life that was often chaotic. Not all that long ago, Shewl used crack cocaine and was jailed for petty theft. Now, she's a case manager at a nonprofit, working toward a master's degree in counseling psychology. She can see her progress charted in graphs on the computer. "It shows you [that] either you're improving and you're growing, or [you have] stagnated," she says. "And it keeps you accountable." But like many people, Shewl didn't get where she is without a lot of help. Besides the Family Independence Initiative, there were counselors, substance abuse programs, church members and friends. She also has a lot of personal drive. The program seems to works best for those who are already motivated to do well. Miller, founder and CEO of Family Independence Initiative, admits his program is not a panacea, but it is a promising new approach to an old problem. He says there's still a lot for experts like him to learn from the low-income families who participate.